As modern technology revolutionizes the way we monitor our health, companies are racing to produce the newest and best blood pressure monitors. With healthy competition comes highly advanced products and thus healthy consumers. Accurate, wireless, and portable, these monitors will completely change the way you care for yourself for the better. Take your health into your own hands with one of these wireless blood pressure monitors available in the U.S.A. The award winning QardioArm is a truly smart blood pressure monitor. The clinically validated device measures your systolic and diastolic blood pressure as well as heart rate. 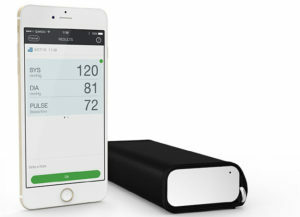 The wireless monitor then connects to iOS or Android devices via Bluetooth 4.0 so that you may view your blood pressure on the WHO chart. The PLACES feature even allows you to see how your blood pressure changes in your multiple life settings, whether you’re at home, the office, or traveling around the world. The impact your lifestyle has on your life will never be more clear to you than with this compact medical device. This wireless blood pressure monitor offers easy and precise self-measurement of your blood pressure with the aid of your smartphone. FDA cleared in the U.S.A., this lightweight cuff is high in accuracy when it comes to both blood-pressure and heart rate and gives instant color-coded feedback based on European Society of Hypertension and the American Heart Association recommendations for hypertension. Extensive data is stored within the Health Mate app, creating an easy-to-read chart and allowing you to track your health overtime. 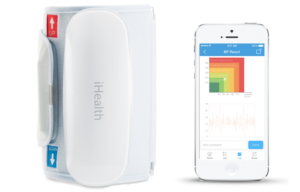 The iHealth Wireless Blood Pressure Monitor measures your blood pressure with the push of a button. 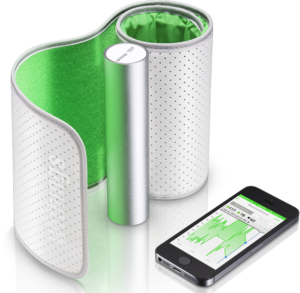 The cuff syncs with the free iHealth MyVitals app which automatically keeps a history of your measurements. The app is available on both Apple and Android devices and additionally allows you to share your information with your doctor or caregiver. Not only is this accurate and reliable monitor FDA approved in the U.S.A., but it is also CE compliant in Europe, TGA approved in Australia and approved by Health Canada. 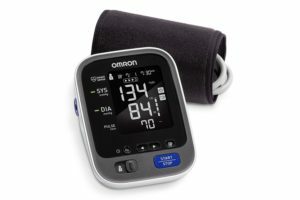 So now that you are aware of the best wireless blood pressure monitors to buy, why wait? Become personally in charge of your own health today, regardless of your location. Consider using Big Apple Buddy to have your favorite wireless blood pressure monitor delivered straight to your door from the USA. We currently ship to over 110 countries worldwide, including Australia, Austria, Belgium, Canada, Denmark, France, Germany, Hong Kong, Ireland, Israel, Italy, Japan, Kuwait, Malaysia, the Netherlands, New Zealand, Norway, Saudi Arabia, Singapore, Spain, South Africa, Sweden, Switzerland, Taiwan, Thailand, the United Arab Emirates and the UK. Learn more about our service or get a free shipping quote for your wireless blood pressure monitor today!